Eachine has really been working the FPV racing concept over the past few years. They keep coming out with new racers and new features trying to perfect the concept. They are on the hunt for the perfect aircraft, and that’s where they need to be. It’s a hunt that never ends, and it’s one that a lot of people are on. This hobby starts the same for almost everyone: you get your hands on an aircraft, fly it, and are awestruck by the experience. Once you get the hang of the aircraft, you start to notice things about it that could be better. It could be faster, more stable, turn better, have a camera on it, etc… That’s when you improve it or build a whole new aircraft, and that’s what Eachine has been doing over the past year. They build a racer, listen to feedback, and improve the concept. The Wizard X220 is the combination of all of the experience that Eachine has gained, and it’s getting pretty good reviews. It uses an X frame like a competition racer, and they have finally done away with tilted motor mounts and GPS telemetry systems. 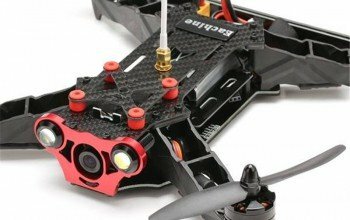 The Eachine 250 racer was a huge sensation in low cost racers, but it couldn’t compete with the smaller X frame racers on the market. The Eachine Falcon series of racers were good starter aircrafts, but they were needlessly complex in their construction. They were fiddly bits of carbon fiber stuck together in an ugly box shape and a real pain to work on. The Wizard uses 3 bladed props standard, and it has the X racing frame layout that people want. The 700 TVL camera gets great range and works really well in low light conditions. I often pull off my VR glasses and notice that it’s a lot darker outside than it looked through the camera lens. The field of view of the camera is really nice and makes low altitude flight really easy, and the video transmitter has a built-in dampener to eliminate signal noise. It also has an extra connector soldered to the video transmitter that the antenna screws into so that if you break the antenna, you aren’t going to damage your video transmitter. Eachine is getting better at making racers. The Wizard looks really good with a black X frame and purple overtones throughout. The rotors are purple, the battery is purple, even the speed controllers are purple. The designer is obviously the same person who designed the Falcon series of aircrafts. The Wizard has the same type of long rectangle body built from fiddly little pieces of carbon fiber; but I have to say it is less fiddly to take apart than the Falcon series of aircraft was. The receiver is pretty easy to access, and the overall design is pretty durable and well thought out. It’s not a bad looking racer. It’s sort of a combination of everything good about a Falcon and everything good about a competition racer. I’ve heard people describe it as beautiful, and the color scheme is well thought out. The rotors were not included in the main box. They came in a different package, so I’m glad they were shipped together. Everything is very tightly packed in foam, and the fsi6 transmitter is pre-bound to the aircraft. You will need to provide your own FPV VR glasses. I used a pair of EV800 glasses from Eachine, and they worked fine. Installing the rotors only took a minute, and the camera and transmitter connected without a problem. It uses a naze32 flight controller, so you can reprogram it with clean flight. The manual is better than previous Eachine aircraft manuals, but it’s still pretty brief. Fortunately, there is a lot of information online about this racer and an active community behind it. With the X frame and the three bladed props, this aircraft gets a lot of speed and lift. My first flight was very fast but not uncontrollable. I flew up high for a minute and got the hang of it before I flew lower towards some trees and started flying through them. As soon as I started flying through trees, I was pretty impressed. It was fast and maneuverable and pretty easy to fly. Like all Eachine racers, it’s programmed to drift on the turns, and the PID settings aren’t perfect. I raced it against a scratch built racer, and it lost pretty badly, so I had it reprogrammed. With the new setting, it was able to do some very quick snap turns without gaining or losing altitude, and it handled itself much better in a race. You don’t have to tune the PID settings, but if you want a more responsive racer you should. The stock set up has two flight modes, but they are not very different. Both are pretty aggressive (one is just a little more aggressive). The type of flying that this aircraft is designed for is full speed gate racing. It’s designed to go full speed and turn quickly. It’s not for the faint of heart. It takes skill and practice, but with a little determination any one can do it. It’s not as good at precision flying as it is at full speed pylon racing. If you’re a serious racer looking for a serious machine, but you don’t want to start from scratch, this is your type of aircraft. You can upgrade everything on it, or you can leave it stock. You can add telemetry, because it has none, or you can fly it as is. It’s really more of a racer’s aircraft instead of a beginner’s aircraft. All the racers I know want to try it out. I’m a big fan of the fsi6 transmitter that comes with this aircraft. In fact, I am using the fsi6 that came with the Wizard to fly my other racers like my QX80 nano. It’s easy to bind to multiple aircrafts, it’s easy to program, and it isn’t a battery hog. I prefer the Flysky version of the fsi6 over the Eachine version because the Flysky version has PPM support. This aircraft has no telemetry or GPS system, but it does have an interesting set of lights. It has green lights on the right side of the aircraft and red lights on the left side. I’m guessing so that your spotter can tell left from right quicker when they give you directions. If you’re flying FPV it doesn’t matter where the lights are, but if you’re flying line of sight it might confuse you at first. The camera on the wizard is great. The field of view is just right for low altitude flight, and it’s really good in low light conditions. They’ve also put a lot of work into connecting the video transmitter to the antenna. It sounds like an easy thing to do, but it can be the difference between a good racer and a bad one. The video transmitter has a connector that is secured into the carbon fiber frame with a rubber grommet, and your antenna screws onto that connector. It really eliminates a lot of signal noise from vibrations, and it really helps protect the video transmitter during a crash. There isn’t much room, but you can mount a GoPro or action cam to the top of the aircraft. The battery takes up a lot of space, but you can make a camera fit. It even comes with a little frame that holds your GoPro. If you’re looking for a good racer that can be upgraded and modified, you might want to consider the Wizard X220 from Eachine. It’s ready to fly and easy to tune. The camera and video system work great, and the included transmitter is very versatile. The triple bladed props get a lot of lift, and the motors are very powerful. This aircraft has a lot of speed and power and the ability to use that power. It’s the type of aircraft that I want to tune and fly and tune some more until it’s perfect. It’s something that I feel like I could actually compete with if I practice a little more.